On the 18th of February Christchurch schools were told their 'interim' fates. Some schools were spared from closure/merger and will either remain on site (being repaired or rebuilt on that site) and some will be rebuilt on another site. 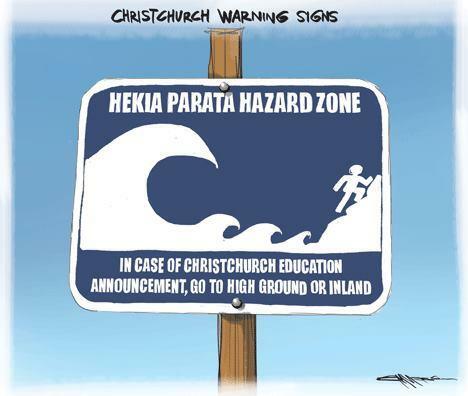 Some schools on the other hand will be closed or merged with another school, meaning that some communities will lose their identity, lose the place that has truly held many together since the total devastation that wrought Christchurch and its surrounds on the 22nd of February 2011. Some schools, particularly around Aranui, still have decisions to be made. But one thing I found most incredulous was the timeframe. All these closures and mergers are to be completed for the beginning of the 2014 year. This timeline is completely at odds with the conversations many of these schools have had with the Ministry of Education and the Minister of Education herself. Many schools had been told as part of the consultation last year that there was a timeframe up to 2016 for these changes to be implemented. In particular, several intermediate schools checked with the Ministry that any students entering Year 7 in 2013 would be able to complete their Year 8 at the same school in 2014. They were given these assurances, with at least one of the school's having evidence of Hekia Parata saying so herself - but when challenged in parliament by Chris Hipkins she did what she (and every other National minister according to the Hobbit document) does best: LIED THROUGH HER TEETH!! Of course students, parents and communities are devasted. The central hub of thse communities is being ripped away from them, from many people who still live in damaged houses, drive damaged streets and can not go far without a constant reminder of how their lives have changed on that day two years ago. Principals and teachers and support staff are devastated, and not only because there will be inevitable job losses with the closure and merger of schools. They are devastated because the school is their community too. They have attachments to the people of that community be they colleagues, students or parents. Their schools have a culture, their own specialness, that will be gone once their school closes or merges. The principals, teachers and support staff will mourn the spirit of their school. The general consensus is that National wants to push through these closures and mergers by the end of 2013 before the school year starts in 2014 because 2014 is an election year. National seems to think that if they have swept the situation out of the way before an election year starts that people will forget. I actually think that is rather short-sighted. The people of Christchurch have suffered trauma after trauma over the last two and a half year. Those who have been affected most by school closures, lack of progress in dealing with insurance companies, lack of safe and healthy accommodation, the slow rebuild, etc. will remember. They will know who shut their child's school and forced them to travel to another school. They will know who has not gotten things moving in the rebuild. They will know who let accommodation in Christchurch get to the state it is in. Those people are voters. Another reason why I think this is a stupid idea is the time table is impossible. To close a school can be done. But to merge a school in such a short time, to ensure that at the preferred sites there will be enough classrooms, toilets, plumbing, wiring, data connections, play areas, hard lanscaping, staffing, a school culture, etc. in a mere ten months is laughable. There are not enough trades people in Christchurch now to do the rebuild, so schools will be hard pressed to get someone to do all this work. So when these schools are not ready to roll at the end of January 2014, people will remember. It is also indicative of this government. Since National came in they have come up with many bizzare ideas and policies. With little thought to how these impact people, jobs, communities, infrastructure, etc. they do little if any research, change a perfectly good law and ram something through that is full of holes and costs the country socially and economically for years!! And the only people who do benefit are those on the rich list - again. So here I make a prediction for some schools. She will extend the date of closure/merger for some schools - in particular, the intermediates (she has to, she's been caught out in a bare faced lie again). She will tell you that these schools put up strong and convincing arguments in the consultation that will occur until the end of March. She will tell you that she listened with an open mind and heart (debatable!). She may tell you that MOE forecasting had shown that school infrastructure was going to be difficult to be made ready for the beginning of the 2014 year to accommodate more students on a merged site. She may tell you that this is to ensure that some merged schools can work more closely together to define their culture. Now this prediction is only for some schools. 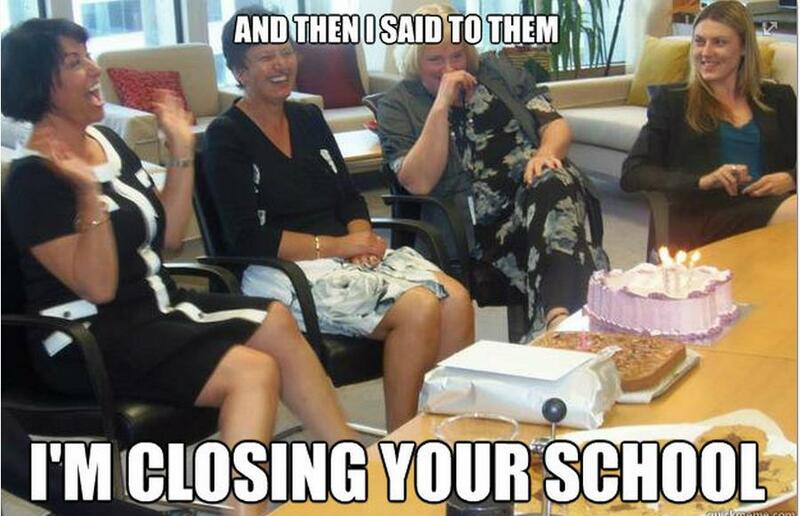 Hekia still has to close some schools. How else will she make room for that riddiculous idea of Partnership/Charter Schools? And yes, I make these predictions from another island, I haven't stood in Christchurch since the earthquake. But I watch, I listen, and I've observed how Hekia works closely. So let's see how these predictions play out. I think everyone agrees that resources and infrastructure and all that has to be looked at in Christchurch, including schools. Everyone agrees that there needs to be certainty. But everyone should also agree that the information is correct, consultation is transparent and moves in both directions, that the decisions are fair and straight forward, and that the time table is achievable and allows a good job to be done. Will that happen for Christchurch schools though? 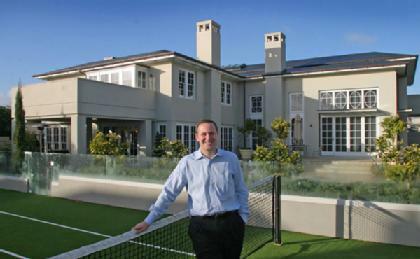 John Key is too "comfortable"! John Key is too damned comfortable. Well, I guess he can be considering his investment portfolio earns him so much money he is able to donate his Prime Minister's salary to charity. He also sent his kids to private school and Steffi has spent the last few years in France, studying I presume. He and his lovely wife live in a lovely big house in Parnell with their cat and Max, and it looks very comfortable from what I can see from the Women's Weekly articles I have read. Hekia Parata's communication ability and how well she has performed as the Minister of Education. How the Novopay debacle has been handled, particulary the role his Minister of Finance and Deputy Prime Minister and leader, Bill English, has played. That Steven Joyce will be able to solve the Novopay problem. That so many people, particulary skilled and educated people, are leaving New Zealand to work in Australia. That the people who have now lost their jobs or are owed thousands or hundreds of thousands of dollars courtesy to Mainzeal going into receivership will find new jobs. That the NZ dollar is so high compared to the American dollar. The affordability and accessability of housing in New Zealand to rent or own. Privacy issues and how they are handled, from the MSD kiosks, to ACC files going to the wrong person, to Novopay payslips being sent to the wrong people and schools being able to access details of people who don't work for them. But I can tell you that people out there, the people who don't live on Planet Key, are not comfortable with how things are going. This is a screen shot of a little interaction I've been having on Twitter the last couple of days with so meone who is/was a Mainzeal employee and does not live on Planet Key. As you can see, NzedKIWI is not comfortable with the situation, nor confident about finding work in a hurry. Google Novopay and you will come up with endless stories of teachers and support staff who have not been paid correctly if at all. You will also find stories of Hekia Parata and Craig Foss as well as Talent2 not appologising or taking responsibility. You will see stories detailing how the milestones have not been met as the payroll system was developed, how the errors were evident before the "Go Live" was given and that it could take up to two years to fix. You will see stories about the inquiries and investigations into who is responsible (I have that answer, it won't cost much for me to tell you) and how these investigations and inquiries and the fix will cost the tax payers even more money! Yet John Key seems to be comfortable with all this. So comfortable that Hekia Parata is still the Minister of Education! However there are many education workers who are not comfortable. They can't pay their rent or mortgage. Bills like credit cards, telephone and internet, electricity, rates, insurance, HPs, etc can't be paid. There have been stories of people not being able to put food on the table or petrol in their cars to go to work. It is so bad now that someone wrote on Campbell Live's Facebook wall about how they were behind someone in the checkout at the supermarket this last Wedneday, the day money should have been in every education workers' bank account. Their card declined, they couldn't pay for the basic staples they had put on the counter. The education worker burst into tears, appologised to the check out person and went out to the ATM to check their balance. They found they had not been paid. The CL contributor followed the education worker, and offered to pay for the groceries. The education worker, tearfully declined. The CL contributer was so incensed they posted on Campbell Live's wall encouraging them to further push into the Novopay debacle. So obviously, the CL contributer is just as uncomfortable about the Novopay issue as many education workers are. Just briefly, many people in NZ are not comfortable that their nearest and dearest have to go to Australia to get work, thus separating families. Many people are not comfortable that NZ is not going the next step with Kyoto or monitoring our environment appropriately and reporting on it. Many people feel that this messes with our clean, green image, with out 100% Pure image. And that we are not that clean and green as we would like to be also leaves many people uncomfortable. There are many people who are not comfortable that they can not afford to rent or buy a house, especially in Auckland and Christchurch. There are many manufacturers and farmers that are not comfortable with how high the dollar is. As a teacher and about to be a first home buyer who has watched friends move to Australia for a 'better life' and is not happy with aspects of our environment, I am not comfortable John Key. I am most uncomfortable with the fact that you are so comfortable about everything!! John Key, you fail the standard. Why Hekia Parata (and Anne, Craig and Bill) should go!! I've been wanting to write my opinions about Hekia Parata for months - but held off in the belief that the right time to blog would arrive. It has. If anything, the last week has shown why Hekia Parata should not be a minister of the government of New Zealand. It beggars belief that John Key did not stand her down in his cabinet reshuffle a few weeks ago - and that really must be due to Hekia's mate Bill English (more on him later) that she still is a minister. The fact that John Key appointed Steven Joyce to sort out the Novopay debarcle also speaks volumes. It tells us that Hekia cocked up and is unable to fix it, to be blunt. But Hekia isn't the only one who should be for the chopping block. Read on as I explain. Talent2 were shortlisted for the payroll contract in 2005 (under a Labour government). Talent2 won the payroll contract in 2008 (under a Labour government). Talent2 said they would have the new education payroll up and running in 2010. The name "Novopay" first became the label for the payroll in October 2008. "There is a good relationship between the Ministry and Talent2" - minutes from the Novopay Board in November 2008. "Project in Yellow status overall due to slippage in some deliverables" - minutes from the Novopay Board in May 2009 (under a National government - Anne Tolley the Minister of Education). "Feedback has raised three areas of concern... risks around the late start for the payroll service" - for a briefing to Cabinet in July 2009 (under a National government). "Concerns raised on slippage in relation to milestone dates.... Talent2 have undertaken to improve processes..." - minutes from the Novopay Board in August 2009. "Information lacking still. Need for a frank assessment... risks around changes to the schedule" - minutes from the Novopay Board in February 2010. "The confidence level of the proposed 'Go Live' date remained low" - minutes from the Novopay Board February/March 2010 (under a National government with Anne Tolley still the Minister of Education). Go Live formally delayed until 2011 in May 2010. "The Board should real concern the project had missed the first milestone..." - minutes from the Novopay Board in July 2010. "There are also some trust issues between teams... A frank and open discussion took place" - minutes from the Novopay Board in July 2010. "The Board needs to have confidence in the Project to be able to report to the Minister and the Cabinet on progress" - minutes from the Novopay Board in January 2012 (under a National government with Hekia Parata having been the Minister of Education for one month). "The Board noted it does not have confidence in Talent2's forecasting..." - minutes from the Novopay Board in January 2012. "A formal warning letter was delivered to Talent2" - minutes from the Novopay Board in April 2012. "Talent2 is laying the foundations for an allegation that the Ministry is in breach of its good faith obligations..." from a highly confidential internal MOE memo dated 19 April 2012. "This is a clear signal that Talent2 will adopt the position that any termination by the Ministry would amount to repudiation of contract... If correct, that would entitle Talent2... to pursue the Ministry for damages." So back in November 2008, all was cheery and rosy, the honeymoon stage so to speak. So what went fundamentally wrong between then and August 2009? I could say that it was a change of government, a change of leadership at the top. We all know that as soon as National came to power there was a dramatic change of culture within the Ministry of Education, they stopped talking to schools and ECE centres and collaboration and consultation ceased. Was she just too inexperienced as a minister? Did the MOE cover up the extent of the deficiencies of Talent2? Were the MOE too scared to tell Mrs Tolley what was happening? When National came in, they had a policy of decreasing the public service, taking people out of backroom jobs and putting them on the frontline. The MOE was not immune to this, and lost some quality people with a lot of institutional knowledge and experience. Those remaining in the MOE may well have been considering their job security when it came to rocking the boat over the Novopay lack of progress. Combine that loss of knowledge and experience with concerns over job security and the fact that Anne Tolley was quite well known for throwing wobblies when she was told something she didn't want to hear from the MOE, and the answers to the above questions could be answered with: "quite possibly, yes." Karen Sewell was still the Secretary of Education at this stage, but left the position in 2011 when Lesley Longstone took up the role. It was not a secret that Ms Sewell was not a fan of National's education policies and was having difficulty stomaching the implementation of these policies. One does wonder if she also tried to have a frank discussion with Minister Tolley over the lack of completion of milestones by Talent2, but was rebuffed. So we know that there were concerns as early as August 2009 that the new Novopay pay roll system was in trouble for implementation in 2010, but then 2010 comes and "confidence is low" in Talent2, the 'Go Live' is pushed back to 2011 and no one is jumping up and down?? This is public money!! John Key talked constantly of transparent government, but where is the transparency here? Shouldn't there have been enough concern at the fact these milestones were not reached in mid 2010 to start an audit or investigation of some sort? But then again, Anne Tolley was somewhat distracted by the strong opposition to National Standards that was in full swing at the time. And as we know, Novopay did not 'Go Live' in 2011. But New Zealand Post's new pay roll system did in April 2011. "EPMU national industry organiser Joe Gallagher told NZ Newswire that problems with the pay system at NZ Post provided by Talent2 are ongoing more than 18 months after it went live on April 1, 2011." Check it out by clicking here. "Mr Gallagher said problems with the Talent2 system at NZ Post begged the question of why the company got another government contract.... NZ Post workers had been over-paid and under-paid. There had been thousands of mistakes from a system that was not fit for purpose.... 'I could go on all day about it,' he said. Even now it is still not perfect, and they are still ironing the problems out of this "dog"." Would it scare you much if I told you now that the Fire Service will this year "Go Live" with a pay roll developed by Talent2 as well? My source tells me that fire fighters are nervous and are ready to walk off the job if the first pay goes wrong. John Campbell's summary misses out anything that happened regarding Novopay between July 2010 and January 2012. One wonders what happened, or didn't, during that 18 month period. Because wouldn't this have been a good time to make sure it was fixed? Is this the reason why Anne Tolley was moved sideways from the Education portfolio into the Police and Corrections portfolios rather than failing to get on top of the resistance to National Standards and plain being a useless and tactless tantrum throwing Minister of Education (by the way, I feel your pain police members and prison/corrections staff)? So after the 2011 election John Key reshuffled his cabinet. Moving Anne Tolley out of the Education portfolio was the answer to the sector's prayers. We looked at Hekia Parata as a new set of eyes and ears, and hoped that she would be more forthcoming in collaborating with the different areas of the sector. Hekia has managed to allienate the education sector in such a professional way that Anne Tolley could only profess to be an amateur! Hekia spoke at Learning at Schools in Hamilton in January and later in April at the National Aspiring Principals Programme (NAPP) hui and impressed with her ability to speak with authority of the issues of the day and statistics without referring to notes. By the time of the Rural Principal's conference in August, the announcements to the Christchurch Schools in August and her amazing performances at the NZEI and PPTA annual meetings in September/October, we knew that she had the same speil to give to everyone and did not like being challenged. She pointed her finger at the Rural Principal's conference, waggling it at them like they were naughty children. She knew what all those colour coded badges meant the day that she sat with Lesley Longstone and Gerry Brownlee to tell the principals and board chairs the fates of their schools. She sat there with a sour look on her face and steam coming out of her ears at NZEI's annual meeting because members rebutted her policies and ideas and told her how it actually was, but she also offended every teacher in the room when she told us we were failing to teach guided reading, mathematics and science effectively (maybe that's because National dumped the Literacy Project in favour of National Standards, hijacked the Numeracy Project with National Standards, and decimated our advisory services so we no long have science advisors)! And then she told off the PPTA annual meeting because Pasifica and Maori children are failing because teachers don't pronounce their names properly (perhaps we should just call her Patricia). Ignoring advice of the MOE and following Treasury's advice instead to increase class sizes under the lie of "improving teacher quality. Ignoring the electorate/parents cries of foul against increasing class sizes. The backdown - only after John Key realised it was an epic fail of a policy and was hurting his popularity in the blue ribbon electorates. The announcement that the minimum teacher qualification should be a one year post-grad (God help children if this comes to pass!). Signing off on Novopay to "Go Live", despite the Novopay Board saying that there were at least 147 problems with it, without investigating further. Not fronting over Novopay or the reorganisation of Christchurch schools. An atrocious relationship with her Secretary of Education, Lesley Longstone, which spilled out into the public domain and culminated in Longstone resigning. Going through several private secretaries and a losing a senior advisor two months into a two year secondment. The lastest private secretary to go was just before Christmas. Passing the buck for Novopay onto Craig Foss. Refusing to attend important events in the education community within New Zealand and overseas. Refusing to engage with the NZEI, PPTA, NZAIMS, early childhood organisations and other organisations over educational issues. And as for John Key's assertion that there is no other person who cares as much about the achievement or the underachievement of Maori and Pasifica children than Hekia Parata, well he does a disservice to every teacher with Maori and Pasifica students in their classes. And that comment on her being a top notch communicator - sure, if you like her cliches and jingoisms, I'm quite sure she would make a killing in the world of advertising or sales... perhaps she should work with Suzanne Paul selling some Natural Glow or some new wonder vacume cleaner!! For another blogger's view of Hekia, read this blog "What the Hekia?" and realise I'm not the only one who thinks Hekia is not up to the job. So far I have commented on Anne Tolley and Hekia Parata in their time as the Minister of Education. I have shown that they both had numerous opportunities to prevent the train wreck that is Novopay. But two more people have a part to play in this debarcle. Craig Foss was given responsibility for Novopay. I've been wondering when that happened exactly.... does anyone know the answer? John Key claims that this was done to allow Hekia to oversee the set up for Charter Schools (another dog of an idea), which one would think should have been in John Banks' court considering it was supposedly an ACT condition of coalition, but then Banks was a bit busy at the time dealing with his dodgy donation deals. How soon did Hekia know that Novopay was a "dog with a few fleas" (to borrow Steven Joyce's apt phrase) and decided to throw that hospital pass onto someone else? Why didn't Craig Foss ask the questions when the milestones weren't met and the Novopay Board questioned weather or not the "Go Live" would work? Why was he not more upfront with the education community and the questioning in parliament? Why did Craig Foss sign off on the "Go Live" despite the 147 identified errors in the pay roll system? And then there is Hekia's good mate Bill English. Minister of Finance, Deputy Prime Minister, Deputy National Leader, number two in the National Party rankings. (I have a lot more I could say about Bill English and his performance, but another time). Hekia is a part of this government because she is Bill English's protege and mate. And Bill English, I assume because he is the Minister of Finance, also signed off on Novopay to "Go Live". Surely, the man who is in charge of the government's finances, in charge of how our taxes are spent, would make sure he was approving the go ahead for a project that wasn't going to cost the tax payer a fortune and embarrass the government he is deputy leader of? But it seems the answers to all my questions regarding the roles of Anne Tolley, Hekia Parata, Craig Foss and Bill English are rather unsatisfactory. As a tax payer I feel we are being cheated by a government that can not dot its 'i's and cross its 't's in the rush to implement poor policy and sell off our country. As a teacher who has begun at a new school this last week, I wait nervously for Wednesday morning to see if I have been paid or not (my new principal assures me that all the feedback from Novopay is good, but please excuse me if I have no trust in Novopay).